Uttarakhand State Tourism Board has started the exercise of biometric registration for devotees and facilities like SMS alerts in case of an emergency for the upcoming Char Dham Yatra, which is all set to begin from May 2014. Due to the extensive damage to lives and property during last year’s natural calamity, the confidence of visitors in their own safety & security also took a beating in the flashfloods. The routes to pilgrimage sites such as Badrinath, Kedarnath, Yamunotri, Gangotri and Hemkund Sahib will open on different dates from 2nd May to 25th May. 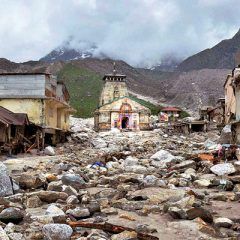 The portals of Yamunotri and Gangotri will be thrown open to devotees on the occasion of Akshaya Tritiya on May 2, Kedarnath on May 4 and Badrinath on May 5. The journey to Sikh shrine is slated to begin on 25th May. A Char Dham Yatra control room will be set up at the tourism directorate where devotees will be given all the information related to the high altitude shrines located in the state. It will operate from 7 AM to 9 PM. The control room will be linked up to the district magistrates of Garhwal region and the regional offices of all departments. Besides control room, there will be a disaster control room which is already operational and allow visitors to get information such as weather updates, availability of hotel rooms, hospitals, petrol pumps and ATM’s close to lodges and hotels.